With spring finally in sight, my mind has been on Easter and Mother's Day gifts. I love giving candles with fresh scents during the spring season because it make the home feel so clean and inviting. This year, I came across an organization that not only makes amazing scented soy candles, but uses their company to create opportunities in the community. The candle company is called Bright Endeavors and they've got quite a story that I encourage you to check out below. Every candle sold provides more opportunities for young moms and their children. Bright Endeavors offers a variety of candles as well as gift sets. I chose the 3 oz glass votives because they're the perfect size to freshen virtually any room and I love the idea of pairing them with a few other items to make my own gift baskets. All of these 3oz candles are made in Chicago from soy wax and phthalate-free fragrance, with a burn time of 12 hours. For Spring, I chose the scents below. They all smell so good that I'm torn between which ones to keep and which ones I'll part with as Easter gifts. The Lavender is hands down my favorite though! I especially love that the company adds a personal touch to the candles by including the name of the person who made it on the bottom. It's a nice reminder that your purchase is changing lives, since 100% of the proceeds support young mothers. 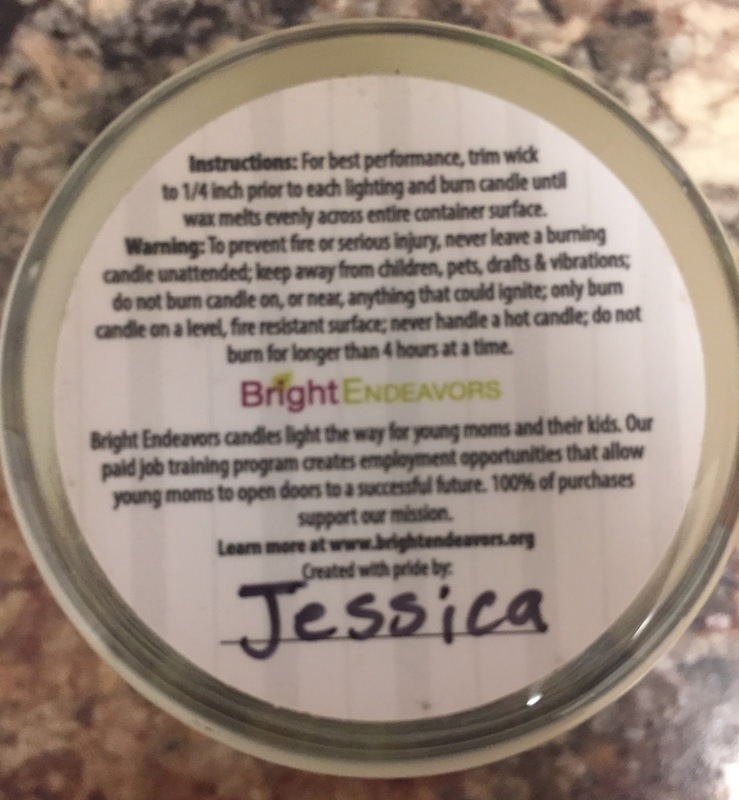 Bright Endeavors offers young mothers the opportunity to transform their lives by teaching them to craft premium soy candles in a supportive, professional environment. They offer paid training opportunities, guidance and skills that young mothers can use to secure quality employment. This gives them a path to provide a safe and successful life for their children. Learn more about the Bright Endeavors mission here and watch the video below. Disclaimer: 3 ounce candles were provided for this post. As always, our posts are our own, honest opinions and may differ from yours.